But thankfully, the make-up Gods pitied us, heard our frustrated tear-filled calls for help and blessed us with the genius idea of a thing called fiber products. One such brand that is making sparse brows and lashes a worry of the past is Cherry Blooms. 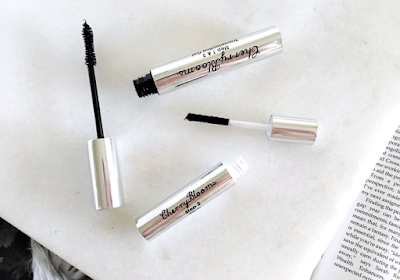 An Australian owned company that is widely known for their unique Fibre Lash Extensions and Fiber Brows, these products not only create a natural look but are also super quick and easy to use - even for super novices like me! I have been using a few of their products for a couple of months now and I like to think my brow/lash/liner game has some what improved - to see how I got on and if I am no #Instaworthy read on! From their humble beginnings as a stall at a weekend market in Brisbane back in 2008, Cherry Blooms are not only favourite among Australian beauty therapists and make-up artists, but are also taking on multinational beauty heavy weights. After their founder Jellaine Dee took the plunge to showcase her brand at a Beauty Expo in US with her baby daughter, one assistant and 13 suitcases jampacked with samples, Cherry Blooms is now being distributed across the United States, Canada and several South American and European countries. And it's not hard to see why their products have been such a major hit across the globe. Cherry Blooms products are the perfect addition to every make-up collection - especially for amateurs like me! A definite stand out product for me is the Cherry Blooms Fiber Brow Kit with Stencils*. 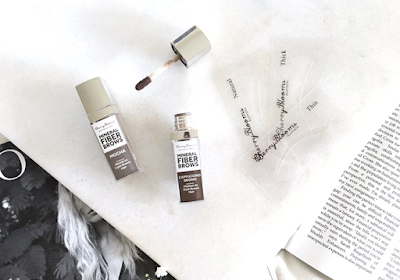 This product is one that has earned its spot in my daily make-up routine and also featured in my Best of Beauty Make-Up Picks for 2016 - I am honestly not sure what I have been doing without for so many years! The Brow Kit includes a set of 3 stencils ranging in shape and thickness, as well as the mineral fiber brows. I was given 2 out of the 4 shades to try; Mocha and Cappuccino Brown. I found that Cappuccino Brown was the closest match of the 2 to my natural brow shade as they are quite dark. As my brows are naturally quite sparse this product is an absolute God send. I usually use my beloved ABH Brow Wiz to create my brow shape but I found the stencils easier to use when I was running late or really just couldn't be bothered to deal with brows (lazy girls unite!) However on a regular day, I now first use my ABH pencil first and follow up with the fiber brows to really fill in the patchy and sparse areas without looking 'drawn on,' blocky or overly fake. A little goes a really long way to create the illusion of polished, full and shapely brows with this. My one gripe with this product is how messy it is. The instructions specify to remove the applicator from the tube very slowly but somehow I still manage to get fibers all over my vanity which I feel is such a waste of product! I also wish that the applicator was a tiny bit thinner as I initially found it hard to control the precision and amount of product I applied but with plenty practice I managed to get the hang of them. All in all, if you have very sparse or thin brows I would highly recommend that you try this product! Another Cherry Blooms product that I was quite impressed with is their Eyelash Extensions Brush On Fibre Lashes*. I am lucky enough to have quite long lashes, but who can say no to extra helping hand to give them that extra 'oomph' - and that is where this baby comes in. I have tried many other fiber lashes in the past and let's just say that didn't end well and I wish I never even thought of trying them. But this one by Cherry Blooms is easily the best I've used. This products comes in 2 tubes with 3 steps to create a false lash effect without the stress of actual false lashes. Step 1 & 3 looks like a regular mascara but is actually beeswax that you use to coat the lashes, while Step 2 is the high quality black fibers. The result is natural looking, larger and thicker lashes. This product promises lashes to enhance your lashes by 600%, and while I think that might be a tad of an overstatement, you can definitely see that my lashes are much fuller without looking overly fake. The last product from Cherry Blooms that I have been trialing is the Vinyl Liner 24hr Waterproof Liquid Eyeliner*. Now usually I don't even attempt to try using any other liquid eyeliner form than the usual felt tip (Stila, Kat Von D etc.) as I find I can't control the application quite well. So to say I was worried to try this is an understatement, I mean winged liner is already hard enough as it is! But I did it anyway all in the name of beauty. As expected, my application was shocking but maybe after the 10th attempt of application I managed to achieve something that loosely resembled a cat eye. In terms of formula and wear, this was definitely a true black that applied quite glossy and dark but was a little bit patchy and needed a few layers to get full coverage. Once dried it looked a tad shiny or sorta like it was a thin black film sitting on top of my eyelids. It did however have great longevity and lasted a full work day considering I have pretty oily lids. For me, this was overall hard to apply and I am not a fan of the finished look, I much prefer a matte black finish. 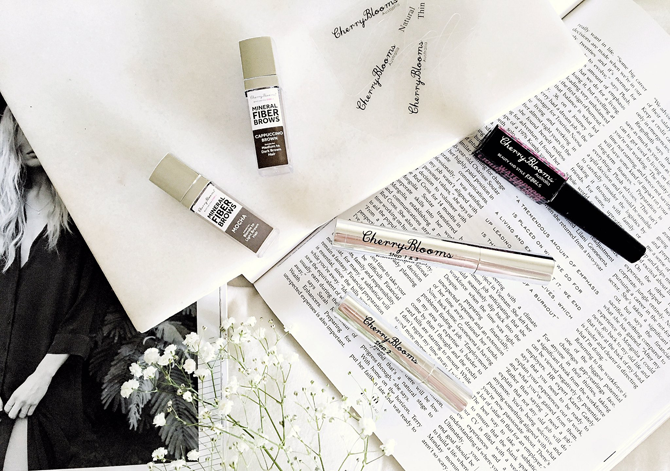 All in all I am quite impressed with these products from Cherry Blooms, with the Fibre Brows easily being my favourite of the 3, and a product that I would definitely repurchase because my brows need all the help they can get! What makes Cherry Blooms even better in my eyes is that their products are cruelty free - and who doesn't love a bunny approved brand! You can buy Cherry Blooms from their online store, David Jones or select salons nationwide. Have you tried Cherry Blooms before? Or have you had an experience with fiber brow or lash products? Let me know below! Ohhh these sound so good!! That extension brush on fibre sounds awesome, cause I haven't found one that I really enjoy yet either!! Ooh I've never heard of this brand before. I need to try to find it here in the States!